I offer the following reviews of apps that might support your current meditation/mindfulness practice. I do not offer these as a substitute or replacement to the simple practice of sitting silently and following your breath. I started with their free 10-day Basics pack and later with their subscription starting at $7.99/month. Subscriptions offer different session categories: mini, single, and packs. Users have the option of changing the length of these sessions. PLUSES: Mini and Single sessions range from body scan to at-work presentations, to eating. Packs include health, anxiety, stress, sleep, and much more. A recent update to the app has added an “Animations” tab, offering a library of video animations (here’s an example of one animated video). They animate everything from essential meditation techniques to frequently asked questions like Am I Doing It Right? Headspace is my go-to app for guided meditations, which I’d recommend for beginning meditators. With its inviting and simple user design experience, I don’t have to fuss around for what I need. Another plus is that you can invite people to become your “buddies.” You can view your buddy’s stats (total time meditated, sessions completed, etc.) and you can even support each other by sending them a “nudge”, a quick email or text reminding them to meditate today. MINUSES: The longer duration sessions are the same guided instructions as the shorter ones just with more silence between speaking. There’s also a lot of redundancy between many of the sessions, a session on stress can sound similar to a session on health. This may make some sense since those are related topics but it offers less variety for practice. Finally, you are exposed to one teacher, Andy Puddicombe, founder of Headspace. One may get “bored” by his voice, and lack of variety. RATING: 4/5. My go-to for guided meditations, recommended for beginners. DESCRIPTION: Insight Timer is a free meditation app that offers hundreds of meditations and meditation teachers (claiming 1,500 teachers). Exploring meditation sessions requires navigating the bottom of the screen and tapping on the headphones icon. Once there, you can choose to explore categories such as Popular, Guided Meditations, Music, 365 Playlist (new meditation every day), Talks, and Teachers. PLUSES: Insight distinguishes itself from the other meditation apps by offering hundreds of free guided meditation and teachers. 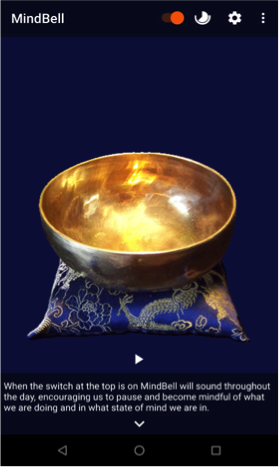 The app also provides a timer with the option to set a duration, interval bells, ambient sounds, and an ending bell to your unguided meditation. I use this app when I engage unguided meditations. Another useful feature is the ability to join a community forum. When you tap the “four-circle” icon on the bottom of the app, it displays a list of groups to join, ranging from discussions on “Loving Kindness” to “Beginner’s Mind” to one on “Thich Nhat Hanh”. This feature honors the wisdom behind mindfulness and the meditation practice by offering an expression of Sangha, or community. You can post questions or simply share your recent meditation experiences here. MINUSES: The user interface was not as friendly as the Headspace App. 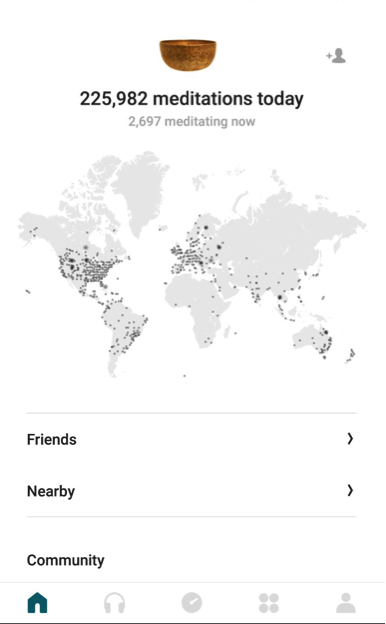 The opening home menu displays “meditations today,” the number of people currently meditating, along with a global map for their location. This menu setup supports their intention of creating community rather than a focus on the practice. RATING: 4/5. For a particular guided meditation like Loving-Kindness, or a simple 10-min unguided meditation, Insight Timer is my go-to app. And, it’s all free! DESCRIPTION: 10% Happier, was developed by Dan Harris alongside the well-known teacher, Joseph Goldstein. Unique to this app is a library of video courses. A subscription is required to access the full library. Subscriptions are $11.99/mo on a monthly basis or $ 6.67/mo for the year. I was able to try it free for 30 days and then canceled, which highlighted a great customer experience detailed in the next section. PLUSES: One of my favorite features is the option to “Just Meditate,” between 3 and 25+ minutes. These guided meditations include topics such as “Meditation for Fidgety Skeptics, Great for Beginners, Morning Meditations, Commuting,” to name a few. All the topics can be easily found in the “discover” tab on the bottom. Answer: Hi Neil, thanks for reaching out and for your question. That’s really a key question isn’t it? Of course, there really isn’t a ‘right’ answer to this question. … (My rep, Yong, then went on for another 200 words — see full response here — to detailing and pointing to future sessions and ended with…) So in our meditation, it may be an itch, but in our daily life maybe it’s a harsh word spoken to us or a car that cuts us off in traffic. They took particular care and concern for feedback, specifically, when I canceled the subscription. The interactions I had with 10% happier may be the best experience I’ve had when asking questions or canceling/unsubscribing from a service. No pressure! MINUSES: The free version of the app doesn’t offer as many guided meditations or teachers, as compared to Insight Timer. RATING: 4/5. Although the free version doesn’t offer much, their paid version offers high-quality content along with the support. For a subscription-based app, this is the app. I felt very supported. DESCRIPTION: Next is Calm, rated “App of the Year” by Apple in 2017. There is a free version along with these subscription options: $12.99/mo (billed monthly), $4.99/mo ($59.99 billed yearly), or a $299 lifetime subscription. PLUSES: Calm focuses a lot on sound, music, and sleep. Open the app to soothing outdoor sounds and an animated mountainous scenery. (You can change this scenery/sounds to a fireplace, thunderstorm, evening crickets, or a mystic fountain). 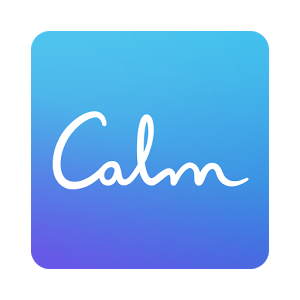 Calm includes a tab on “Sleep Stories” to help you fall asleep; and, a tab for music to soothe you into sleep or accompany an unguided meditation. Calm also added a Masterclass tab, which offers classes such as,” The 4 Pillars of Health, Rethinking Depression, The Power of Rest,” and more. MINUSES: I didn’t find this app to complement my meditation/mindfulness practice much. Its heavy focus on sleep, sound, and music, can overwhelm options for meditation. I sensed that their intention is to reduce stress and anxiety, in order to calm. 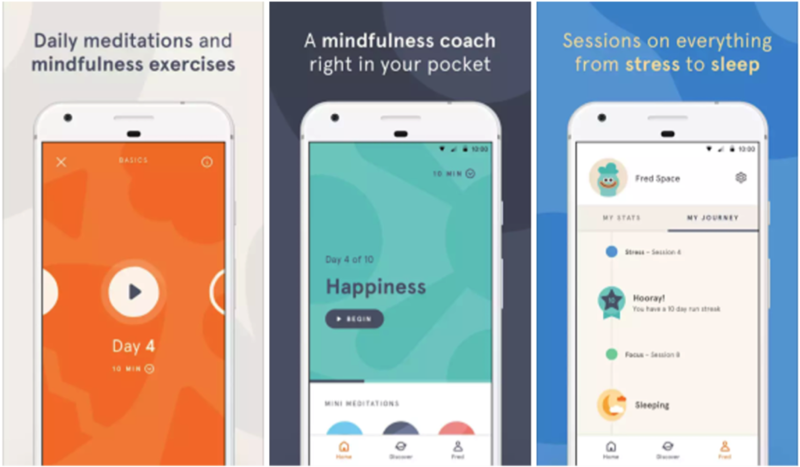 This is different from other apps that focus on the techniques of meditation and mindfulness. RATING: 3/5. This app is great for helping you soothe into sleep or to offer music/sounds with your unguided meditation. It lacks techniques for improving practices of meditation and mindfulness. DESCRIPTION: Mindbell is a free app that rings periodically during the day. It offers an opportunity to pause, breathe and just Be, or can be used as a meditation timer. Pausing at the sound of the bell is an essential practice developed by Thich Nhat Hanh and the Plum Village community. He points to it as the foundation of cultivating mindfulness, presence, and self-compassion throughout the day. PLUSES: Personally, I’ve tried Mindbell to at different variables: to ring every 30 minutes; to ring once every hour; and then, to pause more throughout the day. The app’s bell offers an interruption for a duration, which pulls my awareness when it goes off and I’m responding to a text. The sound and app together pull me from my text message screen to the app screen shown on the right. IMMEDIATELY, I want to return back to my screen to work on my text. Slowing my reactions, I struggle to simply be with the duration of the bell. Once the bell has fully rung, the app automatically returns to the previous screen so I can mindfully respond to my text message. RATING: 5/5. Mindbell has a simple intention, to create periodic pauses in your day. It fulfills that purpose well. Each of these apps serves a purpose. It’s best to determine that before signing on. Integrate an app to support, not to distract from your practice. One size does not fit all. Finally, you can find these apps and more in our Mobile Apps page with links to Google Play Store and Apple Store for downloads. 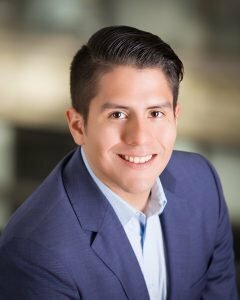 Neil Ruiz is the content curator and IT Manager at Bhavana Learning Group, which serves Learning & Development Professionals. Managing administrative and technical concerns, Neil organizes the firm’s IP and curates its content to supervise programs.